GM Tom Cooper and Gordon Stewart meet in a Preliminary round game. While not at the same level as last year, this year's PanzerBlitz tournament enjoyed a good turn out and quality play. The scenario selection included some previous tournament classics as well as ones composed by William A. Farone, Alan Arvold, and Bill Scott. The success of this year's tournament is attributed more to the contributions of the two assistant Game Masters than to the novice GM. A large thanks goes out to Bill Scott and Alan Arvold for their support and help. The free form open game format allowed 31 matches to be played Wednesday through late Friday. The amount of time per match ranged from 15 to 320 minutes. The average match time for the 31 matches was 145 minutes. The tournament saw several first time PanzerBlitz players as well as old soldiers returning after years of absence. The participation by veterans and newcomers indicate that interest in this classic is still high. Saturday morning six players arrived on time for the deciding matches. They voted to allow more time for other stragglers to participate, as most of the players were also participants in other tournaments. When the seventh ranked player arrived, we solicited the participation of Tony Musella (sorry, we had to wake you up!) to round out the Quarter Final pairings. The records of the single elimination participants ranged from Bill Scott's eight wins to none by Tony Musella and Johnny Hasay. The match times during the finals ranged from 90 to 340 minutes. The average time for the final matches was 150 minutes. The first quarterfinal match saw elements of Johnny Hasay's Russian Rifle Division square off against elements of Marty Musella's German Panzer Division in William Farone's 1941 situation. This situation saw the most plays during the tournament with several attempts at tightening up the play balance with victory condition modifications. Johnny's play of this situation and his solitaire study lead him to believe that he had a winning strategy for the Russian units. The Russian deployment required three turns before the Germans had their foothold in Opustoschenia - it was inevitable as time is on the side of the Russians. The methodical advance of Marty's panzers and support units kept the match interesting, as both commanders knew the fight for Grabyosh and survival or demise of Russian units meant victory or defeat. The march ultimately took control of the ridgeline of hill 107 as well as both parallel streambeds before the final massing of units for the assault on Grabyosh. In the end, the ruthless Germans left a secure supply route by eliminating most of the Russian contingent and exiting the required number of armor units. The victory went to Marty Musella. Quarterfinal match 2 saw another playing of Farone's 1941 situation as Alan Arvold's Germans tried to secure the supply route against Tom Cooper's Russians. Alan's attack plan focused on capturing both Opustoschenia and Grabyosh to secure the supply path, but also pushing as many transport units as possible up the southern streambed for immediate exit off of the board. Alan faced a Russian defense that employed the typical light defense of Opustoschenia and placement of the big guns in the western hexes of Grabyosh, which ultimately required a massed attack against the town. Additionally, Tom deployed infantry units in the woods and ridgeline near Opustoschenia in an attempt to have units in the end which could either fire upon or occupy road hexes on the final turn. Alan secured Grobyosh and exited the required number of armored units, but the surviving guns and infantry of Tom's troops gave him the needed victory points to secure the win. The win went to Tom Cooper. Match 3 of the quarterfinal round pitted Bill Scott's Russians against John Sharp's Germans in the classic tournament situation 1-A. This situation has seen quite a few hours of play in previous tournaments. Bill had seen this situation play a significant role in determining the PanzerBlitz championship in 2003. John's Germans took-up the traditional positions with CPs and forward positions as Bills Russians and partisans made their advance. Early in the match, John's Germans were surprised by the Russians ability to secure an infantry position near a CP in the wooded central hill. The Germans made a strong response with continued counter offensives against the Russian mortar positions. In the end, John was unable to hold off the tenacity of the Russian cavalry as the match ended with an 18.5 to 9 Victory Point win for Bill Scott's Russians. The fourth quarterfinal match found a sleepy Tony Musella playing the Russians against Don Webster's Germans in another play of Farone's 1941 situation. Like most situations, some of the outcomes in the match are repeated from match play to match play. Don's Germans advanced against Tony's defenses in Opustoschenia and were eventually owners of the hexes. Next, the German's massed armor and infantry for the assault against the Russian contingent in Grabyosh. What made this match interesting were the high Victory Point totals achieved by both sides. Don was able to exit the required number of armor units and accumulate more Russian elimination and exit victory points, but Tony was able to secure a significant Vctory Point total with numbers of eliminated Germans and surviving guns and infantry able to hinder the German supply route. The match ended in a Victory Point tie with both sides amassing 42 points. Because the German is required to secure the supply route, the tie went to the Russian. Tony Musella was declared the winner, but withdrew to play in another event. The semifinal match pitted the Russians of Tom Cooper dueling with Marty Musella's Germans in another play of Farone's 1941 situation. Tom again deployed a feisty defense in Opustoschenia that required three turns out of the nine-turn situation for Marty to secure. As in his quarterfinal match, Tom deployed contingents of infantry and mortars on both eastern ridge lines in an attempt to have survivors that would cause havoc (and add victory points) for the German supply line. Marty's skillful use of his 88s and mortars proved up to the task. Additionally, the Germans took the high road as they advanced towards Grabyosh along the southern ridgeline after dislodging and destroying the Russian mortar that scurried around hilltop 107. The final massing of German infantry and tanks proved too much for Tom's Grabyosh defenders as the town fell on turn 7. Marty exited the required number of armor units and deftly deployed the remaining halftracks and units to limit Tom to only 23 victory points. This total was not enough to counter the 32 points amassed by Tony's Germans. The final match saw the #1 seeded Marty Musella playing the #2 seeded Bill Scott. These two veterans have been in this situation several times in the past - both being recent tournament champions. These two generals brought with them extensive experience as well as success. But, in the end exhaustive competition and late nights took their toll. 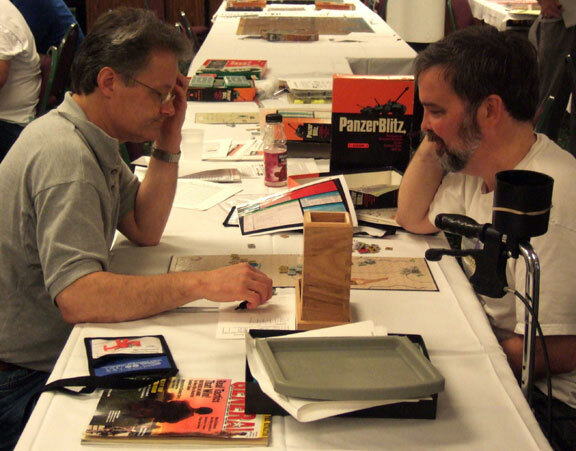 Marty and Bill chose to play Alan Arvold's Tournament 1 situation published in The Boardgamer's PanzerBlitz Special Issue. This situation is an all out slugfest pitting equally matched forces facing each other on board 3. Match play began after 11:00 PM. Bill's Germans took first blood as they attacked and inflicted casualties on Marty's advancing Russians. Play during the next few turns centered on fierce combat around and in Opustoschenia as well as attacks from the large guns on opposite sides of the board. The advantage in Victory Points switched sides seemingly with each attack. Bill had identified the significance of the woods and slopes near hill 107 for any victory for the Russians and made a stand. On turn 4, Bill's Panthers and positions were lost as Marty made an all-out attack with his SU-85s and 120mm mortar and SPA units. Additionally, exhaustion was taking its toll. As was the case in last year's tournament, exhaustion after days of intensive match play becomes the victor as the match extended near 2:00 AM on Sunday morning. With the falling of the positions around hill 107, Bill determined that he now had a losing cause and conceded the match to Marty. In the end, only the participants and the GM were around to witness Marty's second Panzerblitz wood.